"The purpose of the [Neighborhood Recovery Initiative] program to fight violence was to make sure that we had programs, especially for young people after school so they would have positive things they could do to avoid gangs and protect the public safety. That was the purpose of the program. Anybody who lost sight of that . . . they're really letting all of us down." "Clearly, the governor implemented a plan 30 days before the election that was a $50 million slush fund. It smacks of promises made in areas that he needed good turnout to win." Former Gov. Pat Quinn hatched his Neighborhood Recovery Initiative program a month before the 2010 election after 13-year-old Robert Freeman Jr. was shot 22 times on his bicycle on the South Side. 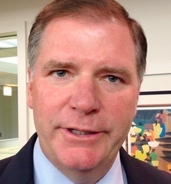 But what began as an answer to violence in 23 Chicago neighborhoods and Cook County townships morphed into a $54.5 million program that Auditor General William Holland said was beset by "pervasive" mismanagement by Quinn's administration and that Republicans, less generously, derided as a "political slush fund." 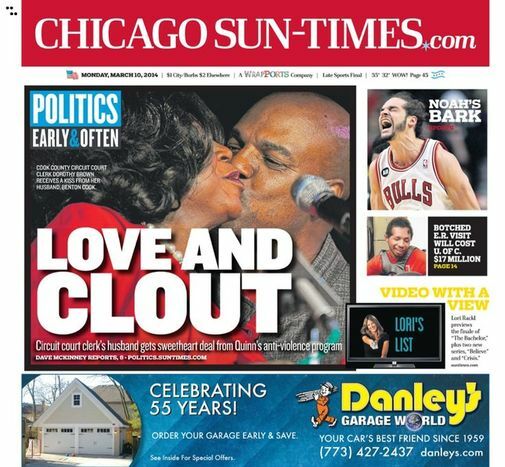 Relying on reams of emails and other public documents that were the underpinning of Holland's audit, I led a months-long investigation last year with colleagues Chris Fusco, Frank Main and Natasha Korecki that showed public, anti-violence dollars went to the politically connected like Cook County Circuit Clerk Dorothy Brown's husband. The clerk's husband, Benton Cook III, was chosen to oversee millions of dollars in NRI programming despite having an undisclosed felony conviction for a past financial crime. I first reported that Cook set up a not-for-profit that received NRI money, and his wife appeared to help manage it, state records showed. I helped outline how public dollars went to a gang member, who was accused of murdering a cohort who also was part of an NRI program. I laid out how a south suburban daycare center was poised to help reintegrate paroled ex-inmates and how one social-service provider got millions in grant funds despite being unable to account for hundreds of thousands of dollars in earlier state grants. I also uncovered emails that showed politics appeared to filter into the Quinn administration's choice to get NRI funding in Maywood, where the husband of former state Rep. Karen Yarbrough was seeking re-election as mayor. The video piece I put together on that story is located below. 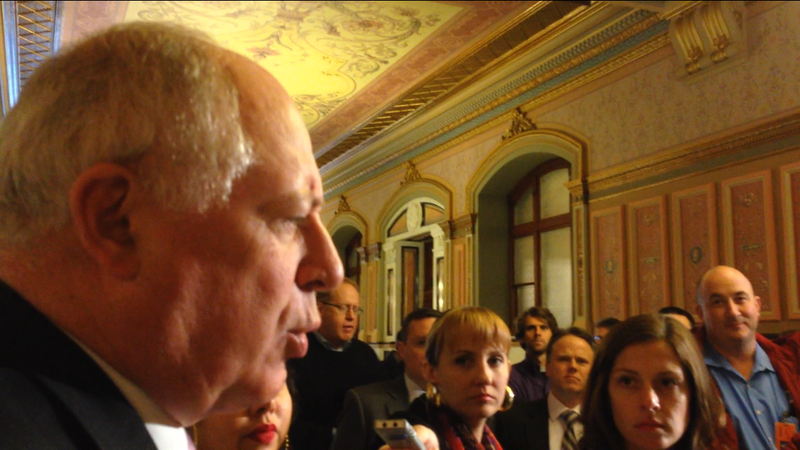 The in-depth reporting on the program became a political headache for Quinn, undercut his 2014 re-election chances against Republican Bruce Rauner and fueled legislative hearings on the matter. Maywood: Did clout trump credentials in NRI award? My video report to the right details spelling out a dispute over where NRI funding should go in Maywood were found within more than 2,000 emails I examined. On one side of the fight was the former state representative, Karen Yarbrough, who wanted NRI funding to be administered by her village, which was led by husband, Henderson. On the other was a social service provider, deemed by the state to be more qualified but believed to be backing a rival of Yarbrough's husband for village president in the near-west suburb. 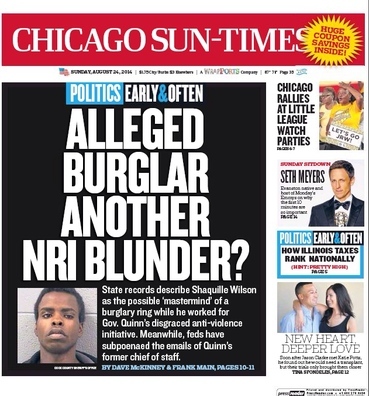 The exchanges represent one of the most clear-cut acknowledgments from within Quinn's onetime inner circle that political considerations did, in fact, factor into some of the decision-making involving NRI.